As I already mentioned in the first review, Deborah Paris aims at completeness of the viewing experience. 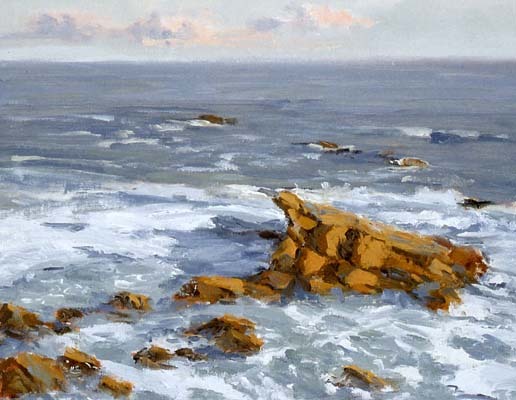 Her marine scenes offer exactly that: the artist employs the relatively limited genre inventory to the fullest. Her template of sea paintings consists of a three leveled composition, with some loud action occurring on the forefront, the sea stretching above and beyond and the sky overlooking solemnly from above. This basic set-up captures the major nature’s ways of showing itself — a disaster, a constant movement and displacement (of water, sand, people) and a serene, meta-calm rest which, in fact, to many may appear the most threatening and portending state of them all. In the forefront we witness a clash of the elements: seawater trying to eat away pieces of the shore, or hitting violently at the rocks that obstruct its clear flow and passage. 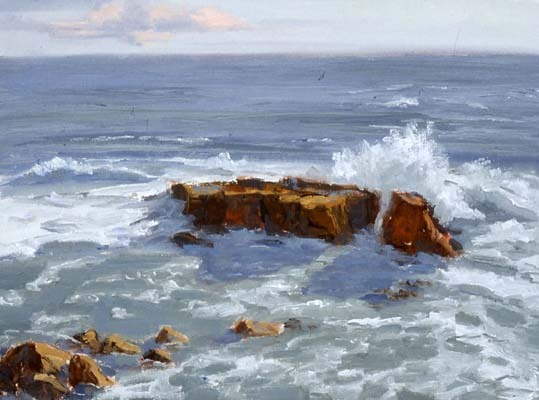 These are the most exciting and energetic parts; they contain notable color variety and a straightforward conflict — the water boils, as if angry, the rocks glare with reflected light, as if baring their teeth in response. 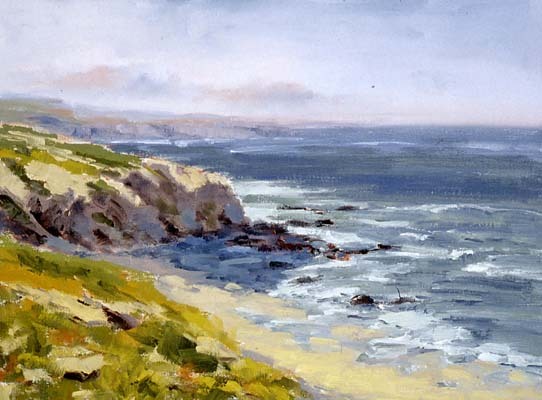 It pleases me that I am able to feel the vibrant atmosphere and almost smell the salty air — the observer is being made a part of the scene by the latter’s sheer force. I would also suggest browsing the artist’s website for the river pieces, where the quiet and calm premise counteracts with glacial softness. There is some restrained irony in how the bustle recedes as we enter the open sea. Strangely enough, the transition does not reduce the tension but only anchors it by waves of unpredictability, imparted by the dirty blue-grays. Moreover, the spray and foam that carried the light in the foreground descend, disappear and eventually transform into fog in the back. As a consequence, the vivacity and swirling is lost, and the audience is left with an unexpected cold visual application, as if a pictorial “wake up and back to reality” call. I think that this transition may bear the metaphorical connotation of the loss of innocence and the shift from adolescence to adulthood — two inherently romantic notions. So if I were to try and categorize these paintings stylistically, I would careen strongly towards romanticism. Surely they are all-rounder than that, otherwise the artist’s intent mentioned at the outset would not bear a single sea cucumber. But there is something over the top — romantic — in these scenes that is difficult to ignore, the whole elemental struggle scenario that works its way from exposition to epilogue with admirable perseverance. And, it is as refreshing as a breath of Mediterranean sea breeze in a warm May morning.